Down a country road way out in the woods about 15 miles outside Chapel Hill, NC, in a tall, wide cage made of chain-link fencing, lives the last remaining Barbary leopard on the planet. Her name is Levra, and she's nearing the end of her life, at 18 16 years old. UPDATE! A helpful commenter notes that Levra, at age 16, may in fact live to the ripe old age of 28 attained by her mother. Actually, some might say that she isn't, in fact, the last Barbary leopard -- her mother was one, and mated with a regular leopardy leopard for one last shot at furthering the species. Still others say Barbary leopard tracks have been spotted in the area of their original habitat, the Atlas Mountains. Not being a zoologist myself, I don't have much to add to that, except to report that we saw her this past weekend at the Carnivore Preservation Trust, and I'm still awestruck by the idea that perhaps the only surviving Barbary leopard in the world lives in the Carolina countryside. I'm probably even more wistful about it since the animal is so beautiful, as is the phrase "Barbary leopard," which deserves to be in a poem. Also, the south just makes me generally wistful. Joining Levra (though in separate cages) at CPT are some other regular leopards, along with several tigers, caracals, binturongs, jaguars, ocelots and servals, all overseen by a restless kettle of vultures swooping around the tall trees most picturesquely as they scope out the carcasses being fed to these carnivores. * On our Saturday morning visit with our gracious hosts, R- and O-, we got the impression that these raptors also were eyeing the gaggle of earnest young Cub Scouts taking the tour alongside us. You can read more about CPT on their Web site -- basically, it's a wildlife preserve descended from a discontinued "captive breeding" program. They also take in "rescued" animals, such as Romeo, originally purchased as a guard tiger by a Durham thug. When Romeo got too big to handle, the guy brought him in to a local vet to see about getting him declawed and de-fanged. The ASPCA took over from there. They also take in animals such as the kinkajou, commonly known for being adopted by the mentally deficient moneyed class. Anyway, pictures. There are some great shots out there by better photographers, such as this and this. But though those I took, below, suffer from my woeful lack of a decent zoom lens, I think they give a more honest view of what it's like to visit (minus the heat and mosquitoes, of course) -- even their keepers rarely see these animals without a cage between them. 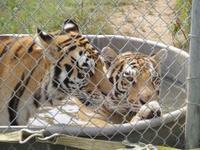 Kaela and Rajah, enjoying a bath. Totally gratuitous shot of Django, the softest, sweetest spaniel in the South, completely oblivious to the creatures down the road who would love to have him over for dinner. *Apparently this is the term for a group of vultures in the air. But a stationary group, as seen above, is called a "venue." Who knew? I have a little west coast travelogue in the works for you, dear reader, but for now I just had to jump in and note the delicious absurdity of this story about the re-make of the classic pagan horror flick* The Wicker Man. I might not be reading carefully enough, but I didn't notice any comment about the weirdness of a Mormon taking on this project. Maud recently asked for work-skipping, bus-missing book recommendations, and I felt a pang on remembering I'd just finished John Krakauer's Under the Banner of Heaven, a page-turner I found so transporting I wish I could discover it again. Living in New York the past few years has given me little occasion to think about Mormonism. The earnest missionaries don't tend to buzz one's apartment door around here. I'm also too much of a ninny to really get into the true-crime genre; when I finally picked up In Cold Blood recently, I had to read it to myself in Philip Seymour Hoffman's funny Capote voice to get past the worst parts. So I was surprised to find myself missing a few subway stops while immersed in Krakauer's book about Mormons and murder. Nominally a true-crime (non-fiction) thriller about a horrifying killing that took place amongst a fundamentalist Mormom spin-off sect in 1984, it's actually more about the history of Mormonism itself -- and on a larger scale, the uneasy balances between fundamentalism and mainstream religion, historical facts and religious faith. Aside from sharing some alarming tales of polygamist sects from Utah to Mexico and Canada (many of which continue to get away with flagrant child and domestic abuse on a regular basis), Krakauer carefully delves into historical documents that tell a fascinating story of the mainstream LDS church -- a religion invented not so long ago. It's a religion that constitutes a powerful political force. According to Krakauer, there are more Mormons than Presbyterians or Episcopalians in the U.S. today, and more Mormons than Jews on the planet. He also cites figures predicting that by the end of the century, the LDS church will boast nearly 300 million members. You can guess what this means for conservatives' future voting power. These fun cocktail party facts are reason enough to pick it up -- but the artful storytelling and engaging voice keeps the pages turning. You really get the sense that this guy -- who basically describes himself as agnostic -- has made a sincere, empathetic effort to understand this religion, and religion in general, from both an intellectual and an emotional perspective. It's an honest and brave book. I guess my second page-turner of the summer thus far has been James Salter's Last Night, a short story collection I apparently came to kind of late, judging from its lofty literary rep. I raced through it last weekend in a delicious rush -- how could anyone resist a story with a line like, "He was mannerly and elegant, his head held back a bit as he talked, as though you were a menu"? The characters are all brilliantly drawn like that, totally compelling. But in the end, I have to admit, I put it down feeling a bit dirty, like I do sometimes after devouring one of those mega-issues of Vanity Fair in an afternoon when I should be writing a dull business article. The writing is gorgeous, yes, and so are the people, and so are their sparkling conversations and surroundings, and it's hard to turn away from them until you've flipped the page just once too often to find yet another well-to-do person, some aging lawyer or arts patron or such, whose material needs are so satisfied he has nothing left to worry about but the achingly beautiful nape of his young mistress' neck. Is this how grown-ups live? I found myself wondering. And will I ever be one of them? Statistically probable sentence: "Westhampton, her tanned legs and pale heels." Oh, do tell. I don't know. Maybe I'm just so burned out from working and battling summer roaches and my creaky old air conditioner every damn day in this hair-destroying, soul-crushing humidity, I can no longer appreciate high-brow literature. Let's see if my tastes escalate after I get back from Newport next week, dahling. RELATED sort of: Was anyone else baffled by this New Yorker cartoon?